From concept to completion, our team is 100% committed to conquer your space with innovation – providing a complete solution. In the unlikely event you aren’t satisfied, we provide a 7 day exchange guarantee*, to ensure your complete satisfaction. *Installation and freight costs not included. Subject to terms and conditions of sale. This website (excluding any linked third party sites) is controlled by us from our principal business premises in New Zealand. It can be accessed from countries around the world to the extent permitted by the website. As each country has laws that may differ from New Zealand, by accessing this site, you agree that the laws and statutes of New Zealand shall apply to any dealings, actions or claims arising out of, or in relation to, this agreement, or your use of this website, irrespective of any conflict with any laws and statutes applicable to your country of domicile. You further acknowledge and agree that the filing of a claim against us (if any) must be made in New Zealand and shall be subject to the jurisdiction of the courts of New Zealand and that any legal proceedings will be conducted in English. 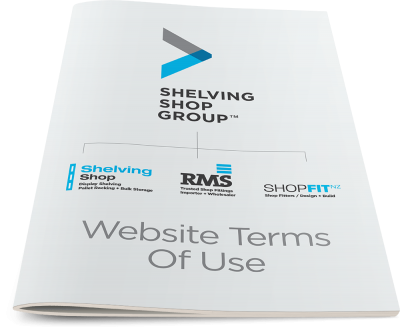 1.1 “Supplier” means Shelving Shop Group Limited, its successors and assigns or any person acting on behalf of and with the authority of Shelving Shop Group Limited. 1.2 “Customer” means the person/s buying the Goods (and/or hiring Equipment) as specified in any invoice, document or order, and if there is more than one Customer is a reference to each Customer jointly and severally. 1.3 “Goods” means all Goods or Services supplied by the Supplier to the Customer at the Customer’s request from time to time (where the context so permits the terms ‘Goods’ or ‘Services’ shall be interchangeable for the other). 1.4 “Equipment” means all Equipment including any accessories supplied on hire by the Supplier to the Customer (and where the context so permits shall include any supply of Services). The Equipment shall be as described on the invoices, quotation, authority to hire, or any other work authorisation form provided by the Supplier to the Customer. 1.5 “Price” means the Price payable for the Goods/Equipment hire as agreed between the Supplier and the Customer in accordance with clause 4 below. 2.1 The Customer is taken to have exclusively accepted and is immediately bound, jointly and severally, by these terms and conditions if the Customer places an order for or accepts delivery of the Goods/Equipment. 2.2 These terms and conditions may only be amended with the Supplier’s consent in writing and shall prevail to the extent of any inconsistency with any other document or agreement between the Customer and the Supplier. 3.1 The Customer shall give the Supplier not less than fourteen (14) days prior written notice of any proposed change of ownership of the Customer and/or any other change in the Customer’s details (including but not limited to, changes in the Customer’s name, address, contact phone or fax number/s, or business practice). The Customer shall be liable for any loss incurred by the Supplier as a result of the Customer’s failure to comply with this clause. 4.2 The Supplier reserves the right to change the Price if a variation to the Supplier’s quotation is requested. Any variation from the plan of scheduled Services or specifications of the Goods/Equipment (including, but not limited to, any variation as a result of increases to the Supplier in the cost of taxes, levies, materials and labour or where additional Services are required due to availability of Goods, or unforeseen circumstances including, but not limited to limitations to accessing the site, safety considerations, prerequisite work by any third party not being completed, change of design, or hidden pipes and wiring in walls etc which are only discovered on commencement of the Services) will be charged for on the basis of the Supplier’s quotation and will be shown as variations on the invoice. 4.5 Payment may be made by cash, cheque, bank cheque, electronic/on-line banking, credit card (or by any other method as agreed to between the Customer and the Supplier. 4.6 Unless otherwise stated the Price does not include GST. In addition to the Price the Customer must pay to the Supplier an amount equal to any GST the Supplier must pay for any supply by the Supplier under this or any other agreement for the sale of the Goods/hire of the Equipment. The Customer must pay GST, without deduction or set off of any other amounts, at the same time and on the same basis as the Customer pays the Price. In addition the Customer must pay any other taxes and duties that may be applicable in addition to the Price except where they are expressly included in the Price. (b) the Supplier (or the Supplier’s nominated carrier) delivers the Goods/Equipment to the Customer’s nominated address even if the Customer is not present at the address. 5.2 At the Supplier’s sole discretion the cost of delivery is included in the Price. 5.3 The Customer must take delivery by receipt or collection of the Goods/Equipment whenever either is tendered for delivery. In the event that the Customer is unable to take delivery of the Goods/Equipment as arranged then the Supplier shall be entitled to charge a reasonable fee for redelivery of the Goods/Equipment and/or the storage of the Goods. 5.5 Any time or date given by the Supplier to the Customer is an estimate only. The Customer must still accept delivery of the Goods/Equipment even if late and the Supplier will not be liable for any loss or damage incurred by the Customer as a result of the delivery being late. 6.2 If any of the Goods are damaged or destroyed following delivery but prior to ownership passing to the Customer, the Supplier is entitled to receive all insurance proceeds payable for the Goods. The production of these terms and conditions by the Supplier is sufficient evidence of the Supplier’s rights to receive the insurance proceeds without the need for any person dealing with the Supplier to make further enquiries. 6.3 If the Customer requests the Supplier to leave Goods outside the Supplier’s premises for collection or to deliver the Goods to an unattended location then such Goods shall be left at the Customer’s sole risk. 6.4 Where the Supplier is required to install the Goods the Customer warrants that the structure of the premises or equipment in or upon which these Goods are to be installed or erected is sound and will sustain the installation and work incidental thereto and the Supplier shall not be liable for any claims, demands, losses, damages, costs and expenses howsoever caused or arising in connection with the installation and work incidental thereto. 6.5 The Customer acknowledges that Goods (including but not limited to paint, timber, tiles) supplied may exhibit variations in shade tone, colour, texture, surface and finish, and may fade or change colour over time. The Supplier will make every effort to match batches of product supplied in order to minimise such variations but shall not be liable in any way whatsoever where such variations occur. 6.7 Any advice, recommendation, information, assistance or service provided by the Supplier in relation to Goods or Services supplied is given in good faith, is based on the Suppliers own knowledge and experience and shall be accepted without liability on the part of the Supplier and it shall be the responsibility of the Customer to confirm the accuracy and reliability of the same in light of the use to which the Customer makes or intends to make of the Goods or Services. 7.1 The Customer shall ensure that the Supplier has clear and free access to the work site at all times to enable them to undertake the Services. The Supplier shall not be liable for any loss or damage to the site (including, without limitation, damage to pathways, driveways and concreted or paved or grassed areas) unless due to the negligence of the Supplier. 8.1 The Supplier shall be entitled to rely on the accuracy of any plans, specifications and other information provided by the Customer. The Customer acknowledges and agrees that in the event that any of this information provided by the Customer is inaccurate, the Supplier accepts no responsibility for any loss, damages, or costs however resulting from these inaccurate plans, specifications or other information. 8.2 In the event the Customer gives information relating to measurements and quantities of the Goods required to complete the services, it is the Customer’s responsibility to verify the accuracy of the measurements and quantities, before the Customer or Supplier places an order based on these measurements and quantities. The Supplier accepts no responsibility for any loss, damages, or costs however resulting from the Customer’s failure to comply with this clause. (a) until ownership of the Goods passes to the Customer in accordance with clause 9.1 that the Customer is only a bailee of the Goods and must return the Goods to the Supplier on request. (b) the Customer holds the benefit of the Customer’s insurance of the Goods on trust for the Supplier and must pay to the Supplier the proceeds of any insurance in the event of the Goods being lost, damaged or destroyed. (c) the Customer must not sell, dispose, or otherwise part with possession of the Goods other than in the ordinary course of business and for market value. If the Customer sells, disposes or parts with possession of the Goods then the Customer must hold the proceeds of any such act on trust for the Supplier and must pay or deliver the proceeds to the Supplier on demand. (d) the Customer should not convert or process the Goods or intermix them with other goods but if the Customer does so then the Customer holds the resulting product on trust for the benefit of the Supplier and must sell, dispose of or return the resulting product to the Supplier as it so directs. (e) the Customer irrevocably authorises the Supplier to enter any premises where the Supplier believes the Goods are kept and recover possession of the Goods. (g) the Customer shall not charge or grant an encumbrance over the Goods nor grant nor otherwise give away any interest in the Goods while they remain the property of the Supplier. (b) a security interest is taken in all Goods/Equipment previously supplied by the Supplier to the Customer (if any) and all Goods/Equipment that will be supplied in the future by the Supplier to the Customer. 10.3 The Supplier and the Customer agree that nothing in sections 114(1)(a), 133 and 134 of the PPSA shall apply to these terms and conditions. 10.5 Unless otherwise agreed to in writing by the Supplier, the Customer waives its right to receive a verification statement in accordance with section 148 of the PPSA. 10.6 The Customer shall unconditionally ratify any actions taken by the Supplier under clauses 10.1 to 10.5. 11.1 In consideration of the Supplier agreeing to supply the Goods/Equipment, the Customer charges all of its rights, title and interest (whether joint or several) in any land, realty or other assets capable of being charged, owned by the Customer either now or in the future, to secure the performance by the Customer of its obligations under these terms and conditions (including, but not limited to, the payment of any money). 11.2 The Customer indemnifies the Supplier from and against all the Supplier’s costs and disbursements including legal costs on a solicitor and own client basis incurred in exercising the Supplier’s rights under this clause. 11.3 The Customer irrevocably appoints the Supplier and each director of the Supplier as the Customer’s true and lawful attorney/s to perform all necessary acts to give effect to the provisions of this clause 11 including, but not limited to, signing any document on the Customer’s behalf. 12.1 The Customer hereby disclaims any right to rescind, or cancel any contract with the Supplier or to sue for damages or to claim restitution arising out of any inadvertent misrepresentation made to the Customer by the Supplier and the Customer acknowledges that the Goods are bought relying solely upon the Customer’s skill and judgment. 13.1 The Customer shall inspect the Goods/Equipment on delivery and shall within seven (7) days of delivery (time being of the essence) notify the Supplier of any alleged defect, shortage in quantity, damage or failure to comply with the description or quote. The Customer shall afford the Supplier an opportunity to inspect the Goods/Equipment within a reasonable time following delivery if the Customer believes the Goods are defective in any way. If the Customer shall fail to comply with these provisions the Goods/Equipment shall be presumed to be free from any defect or damage. For defective Goods/Equipment, which the Supplier has agreed in writing that the Customer is entitled to reject, the Supplier’s liability is limited to either (at the Supplier’s discretion) replacing the Goods/Equipment or repairing the Goods/Equipment. 14.2 The Supplier may (in its discretion) accept the return of Goods for credit but this may incur a handling fee of ten percent (10%) of the value of the returned Goods plus any freight. 14.3 Non-stocklist items or Goods made to the Customer’s specifications are under no circumstances acceptable for credit or return. 15.1 Subject to the conditions of warranty set out in Clause 15.2 the Supplier warrants that if any defect in any workmanship of the Supplier becomes apparent and is reported to the Supplier within five (5) years of the date of delivery (time being of the essence) then the Supplier will either (at the Supplier’s sole discretion) replace or remedy the workmanship. (vi) fair wear and tear, any accident or act of God. (c) in respect of all claims the Supplier shall not be liable to compensate the Customer for any delay in either replacing or remedying the workmanship or in properly assessing the Customer’s claim. 15.3 In the case of second hand Goods, the Customer acknowledges that he has had full opportunity to inspect the same and that he accepts the same with all faults and that no warranty is given by the Supplier as to the quality or suitability for any purpose and any implied warranty, statutory or otherwise, is expressly excluded. The Supplier shall not be responsible for any loss or damage to the Goods, or caused by the Goods, or any part thereof however arising. 16.1 If the Customer is acquiring Goods for the purposes of a trade or business, the Customer acknowledges that the provisions of the Consumer Guarantees Act 1993 do not apply to the supply of Goods by the Supplier to the Customer. 17.1 Where the Supplier has designed, drawn or developed Goods/Equipment for the Customer, then the copyright in any designs and drawings and documents shall remain the property of the Supplier. 17.2 The Customer warrants that all designs, specifications or instructions given to the Supplier will not cause the Supplier to infringe any patent, registered design or trademark in the execution of the Customer’s order and the Customer agrees to indemnify the Supplier against any action taken by a third party against the Supplier in respect of any such infringement. 17.3 The Customer agrees that the Supplier may (at no cost) use for the purposes of marketing or entry into any competition, any documents, designs, drawings or Goods which the Supplier has created for the Customer. 18.1 Interest on overdue invoices shall accrue daily from the date when payment becomes due, until the date of payment, at a rate of two and a half percent (2.5%) per calendar month (and at the Supplier’s sole discretion such interest shall compound monthly at such a rate) after as well as before any judgment. 18.2 If the Customer owes the Supplier any money the Customer shall indemnify the Supplier from and against all costs and disbursements incurred by the Supplier in recovering the debt (including but not limited to internal administration fees, legal costs on a solicitor and own client basis, the Supplier’s collection agency costs, and bank dishonour fees). 18.3 Without prejudice to any other remedies the Supplier may have, if at any time the Customer is in breach of any obligation (including those relating to payment) under these terms and conditions the Supplier may suspend or terminate the supply of Goods/Equipment to the Customer. The Supplier will not be liable to the Customer for any loss or damage the Customer suffers because the Supplier has exercised its rights under this clause. 19.1 The Supplier may cancel any contract to which these terms and conditions apply or cancel delivery of Goods/Equipment at any time before the Goods/Equipment are due to be delivered by giving written notice to the Customer. On giving such notice the Supplier shall repay to the Customer any money paid by the Customer for the Goods/Equipment. The Supplier shall not be liable for any loss or damage whatsoever arising from such cancellation. 19.2 In the event that the Customer cancels delivery of the Goods/Equipment the Customer shall be liable for any and all loss incurred (whether direct or indirect) by the Supplier as a direct result of the cancellation (including, but not limited to, any loss of profits). 19.3 Cancellation of orders for Goods made to the Customer’s specifications, or for non-stocklist items, will definitely not be accepted once production has commenced, or an order has been placed. (f) disclose information about the Customer, whether collected by the Supplier from the Customer directly or obtained by the Supplier from any other source, to any other credit provider or any credit reporting agency for the purposes of providing or obtaining a credit reference, debt collection or notifying a default by the Customer. 20.2 Where the Customer is an individual the authorities under clause 20.1 are authorities or consents for the purposes of the Privacy Act 1993. 20.3 The Customer shall have the right to request the Supplier for a copy of the information about the Customer retained by the Supplier and the right to request the Supplier to correct any incorrect information about the Customer held by the Supplier. 21.2 The lien of the Supplier shall continue despite the commencement of proceedings, or judgment for any moneys owing to the Supplier having been obtained against the Customer. 22.1 Equipment shall at all times remain the property of the Supplier and is returnable on demand by the Supplier. In the event that Equipment is not returned to the Supplier in the condition in which it was delivered the Supplier retains the right to charge the Customer the full cost of repairing the Equipment. In the event that Equipment is not returned at all the Supplier shall have right to charge the Customer the full cost of replacing the Equipment. (c) keep the Equipment, complete with all parts and accessories, clean and in good order as delivered, and shall comply with any maintenance schedule as advised by the Supplier to the Customer. 22.3 The Customer accepts full responsibility for the safekeeping of the Equipment and the Customer agrees to insure, or self insure, the Supplier’s interest in the Equipment and agrees to indemnify the Supplier against physical loss or damage including, but not limited to, the perils of accident, fire, theft and burglary and all other usual risks and will effect adequate Public Liability Insurance covering any loss, damage or injury to property or persons arising out of the use of the Equipment. Further the Customer will not use the Equipment nor permit it to be used in such a manner as would permit an insurer to decline any claim. 23.2 These terms and conditions and any contract to which they apply shall be governed by the laws of New Zealand and are subject to the jurisdiction of the Hawke’s Bay Courts of New Zealand. 23.3 The Supplier shall be under no liability whatsoever to the Customer for any indirect and/or consequential loss and/or expense (including loss of profit) suffered by the Customer arising out of a breach by the Supplier of these terms and conditions (alternatively the Supplier’s liability shall be limited to damages which under no circumstances shall exceed the Price of the Goods/Equipment hire). 23.4 The Customer agrees that the Supplier may amend these terms and conditions at any time. If the Supplier makes a change to these terms and conditions, then that change will take effect from the date on which the Supplier notifies the Customer of such change. The Customer will be taken to have accepted such changes if the Customer makes a further request for the Supplier to provide Goods/Equipment to the Customer. 23.5 Neither party shall be liable for any default due to any act of God, war, terrorism, strike, lock-out, industrial action, fire, flood, storm or other event beyond the reasonable control of either party. 23.6 The Customer warrants that it has the power to enter into this agreement and has obtained all necessary authorisations to allow it to do so, it is not insolvent and that this agreement creates binding and valid legal obligations on it.